Compatible with Brother NV4000D Duetta® NV4500D, NV4750D, NV5000D. Innov-ís 1200, Innov-ís 1250D – New!, Innov-ís 1500D, Innov-ís 2500D, Innov-ís 2800D – New!, Innov-ís 40, Innov-ís 4000D, Innov-ís 80, Innov-ís 900D, Innov-ís 950D, NX-250, NX-450, NX-450Q, NX-650Q, QC-1000, Quattro® 6000D Needle Plates. Fits 7 Piece Feed Dog Brother machines: The NV series, the QC series and the NX series. For Use With: Quattro® NV6000D, Duetta® 4500D, Innov-ís 1200, Innov-ís 1500D, Innov-ís 2500D, Innov-ís 40, Innov-ís 4000D, Innov-ís 80, Innov-ís 900D, NX250, NX450, NX450Q, NX650Q, QC1000, Innov-ís 2800D, Innov-ís 1250D, Innov-ís 950D, Quattro® 2 6700D, Isodore® Innov-ís 5000, LB6800PRW, Duetta® 2 4750D, DreamWeaver™ XE VM6200D, Quattro® 3 Trilogy Limited Edition Innov-ís 6750D, Project Runway Limited Edition Innov-ís 40e, Project Runway Limited Edition Innov-ís 85e, Innov-ís NX570Q, LB6800THRD, DreamCreator™XE VM5100, The Dream Machine XV8500D, Innov-is 990D and comparable Babylocks. .
For Use With: DreamCreator XE VM5100, DreamWeaver XE VM6200D, Duetta 2 4750D, Duetta 4500D, Innov-ís 1200, Innov-ís 1250D, Innov-ís 1500D, Innov-ís 2500D, Innov-ís 2800D, Innov-ís 40, Innov-ís 4000D, Innov-ís 80, Innov-ís 900D, Innov-ís 950D, Innov-is 990D, Innov-ís NX570Q, Isodore Innov-ís 5000, LB6800PRW, LB6800THRD, LB7000BNDL, LB7000PRW, NX250, NX450, NX450Q, NX650Q, Project Runway Limited Edition Innov-ís 40e, Project Runway Limited Edition Innov-ís 85e, QC1000, Quattro 2 6700D, Quattro 3 Trilogy Limited Edition Innov-ís 6750D, Quattro NV6000D, SE1800, SE1900, SE400, SE425, SE600, SE625, Simplicity SB8000, THE Dream Machine 2 Innov-ís XV8550D, THE Dream Machine Innov-ís XV8500D and comparable Babylocks. Create Precise Circles Automated fabric pivoting creates precise circles with radii ranging from 30mm to 130mm. 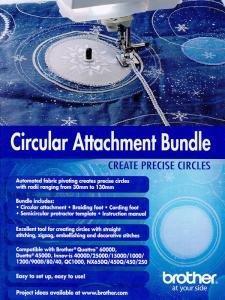 Excellent tool for creating circles with straight stitching, zigzag, embellishing and decorative stitches. Easy to set up, easy to use! Features: This attachment bundle includes the circular sewing attachment, Brother braiding foot, Brother cording foot, a semicircular protractor template, and an instruction manual. Additional accessories to add to your creativity include the Braiding Foot with an adjustable guide that offers you hands-free (after set-up) placement of cords, ribbons and braiding up to 5mm in width centered along selected circle circumference. The Cording Foot for 7mm horizontal machines is used for embellishing projects with 1, 2 or 3 cords or decorative stitches. Great for couching! 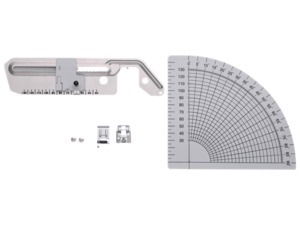 Use the Protractor Template as a guide for easy measuring and accurate stitching. Excellent price and very fast shipping. I have bookmarked your site for future needs. I greatly appreciate the personal follow up regarding my order from the customer service reps.
Order was received, processed and shipped quickly. I am pleased with my purchases and will shop with Allbrands again. Allbrands is my favorite spot to shop for sewing items. I have purchased my last sergers from you guys and you provide quality merchandise and good service. Keep doing what you do - I liked dealing with you. Thanks! Over the years I have used Allbrands.com for purchases from $25 to several thousands of dollars per order and I have always been happy with the products and service. At first I could not tell if all 3 of my ordered items were in one shipment. The description for me online mentioned only the 1st item(Floriani Disc). Other than that, the shipment arrived in excellent time, great condition. I am very satisfied with your service. I have visited your store as well as your website. I have always been impressed with your pricing and customer service. Your company has made a lasting impression on me and I hope to continue doing business with you in the future. Thank you.